It's that REALLY slow time of the year. That time when you know there's more winter ahead yet you're itching to get your hands in the soil. That time when the plants are just sitting there biding their time. What's a gardener to do? 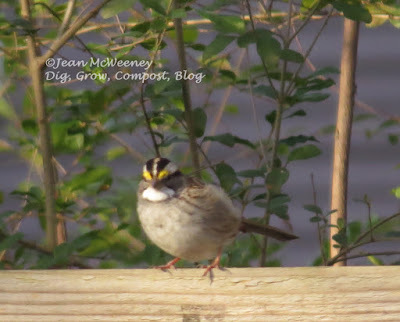 White-throated Sparrow; never mind the invasive Chinese privet behind it in my neighbor's yard! Bird watch! Project FeederWatch to get more specific. Just because it's too cold for us humans to enjoy the outdoors it doesn't mean our bird friends aren't out there. I joined Project FeederWatch, a citizen-science project, just last year. I've birded for several decades now and yet I've found that reporting the birds I see in my yard makes me a better birder. I want to be accurate! Here's an explanation of the project from the Project FeederWatch website: "Project FeederWatch is a winter-long survey of birds that visit feeders at backyards, nature centers, community areas, and other locales in North America. FeederWatchers periodically count the birds they see at their feeders from November through early April and send their counts to Project FeederWatch. FeederWatch data help scientists track broadscale movements of winter bird populations and long-term trends in bird distribution and abundance." Simple. I've also become more aware of how our bird population trends right here at home. 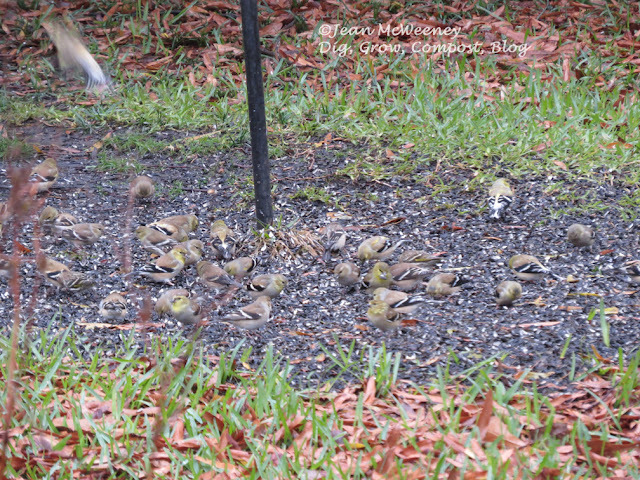 For example, the first American Goldfinch showed up at my feeders in mid November but they were only onesy-twosy. Then about three weeks ago - pow, an explosion of A.G.'s happened! It's a challenge to count them but the fun part is finding the odd bird out, such as the White-throated Sparrow, Pine Siskin, or Dark-eyed Junco. One thing that disappoints me is that more people don't participate in my area. You can see the participant locations on their website. There are only four in all of north Louisiana, myself included! Yesterday we had a break in the weather with temps into the low 60's. 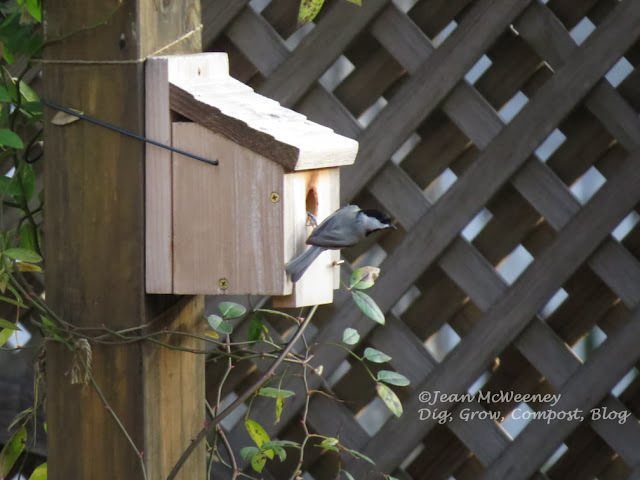 That's when I caught this little chickadee checking out two of the different bird houses in my backyard. Oh boy, maybe spring won't be long now. It's not totally drab and bloom-less outside. The Meyer lemon is doing its usual winter bloom thing. The last couple of winters have been really hard on this old tree. I live in Zone 8a, just a tad cold for citrus. But I have this on the south side of the house in a galvanized trough and since it's fairly short, I cover it during hard freezes. So far this year hasn't been bad but yikes, I thought I lost it a year ago. This year I'm trying an incandescent bulb under the sheets that I cover it with. 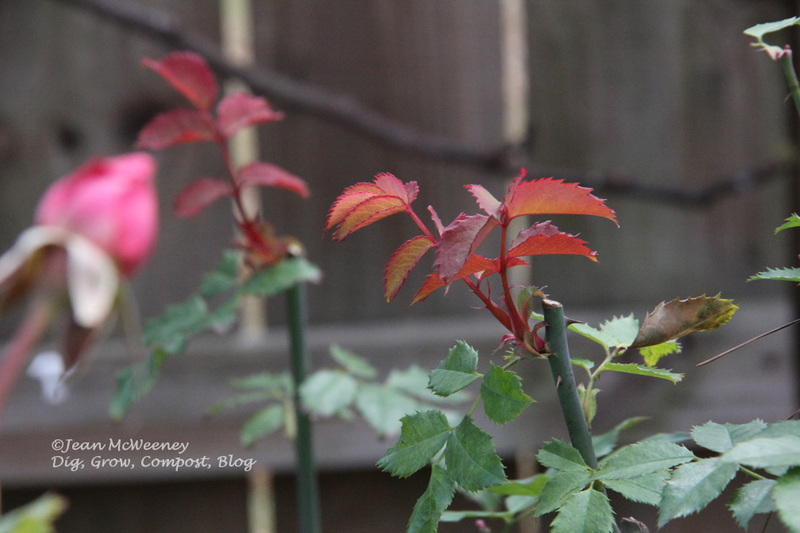 The 'Belinda's Dream' rose nearby wants to start growing as well. Sorry, but that new growth will be cut back in just a couple weeks. It needs some good shaping up, which I'm always happy to do before it really gets going. 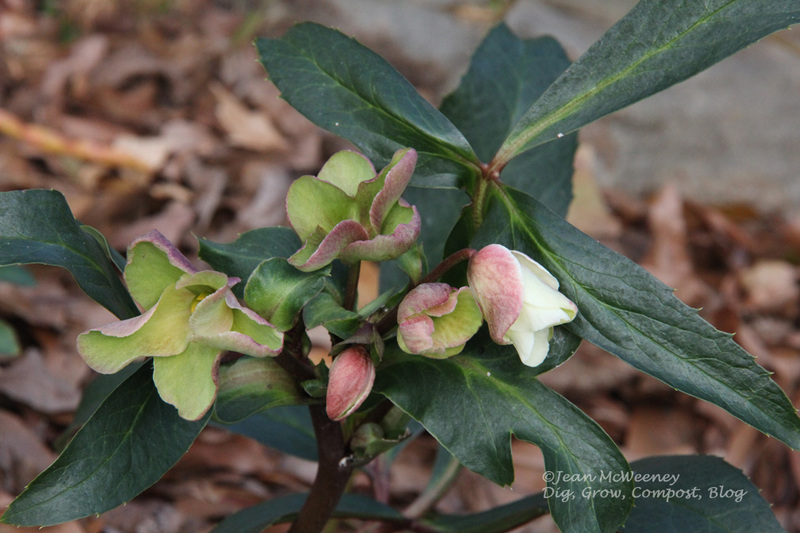 The hellebores (aka Lenten roses) are slow to bloom this winter. So far only Joker is starting to put out. Unknown narcissus, maybe 'Grand Primo'?? Even the daffodils have been slow. They're coming up but the only one blooming now is one I rescued from an old house a few years ago. I do wish I knew what variety it is. I'm guessing 'Grand Primo' but I could be totally off base. 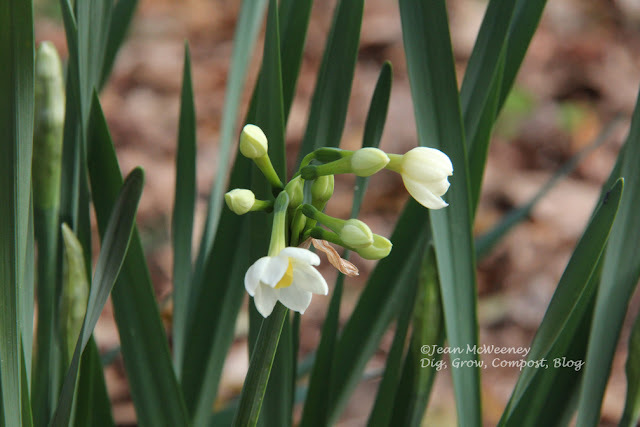 Last year I had at least four different narcissus in bloom at this time. So far this year this is the only one and it's only just started. 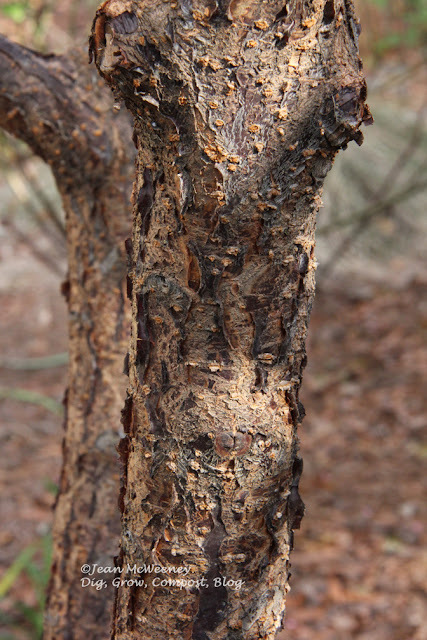 ...its bark. It's really pretty to me. This tree has grown very quickly but it should remain the size of an understory tree, 15-20 feet. Now to leave off on kind of a sad note. 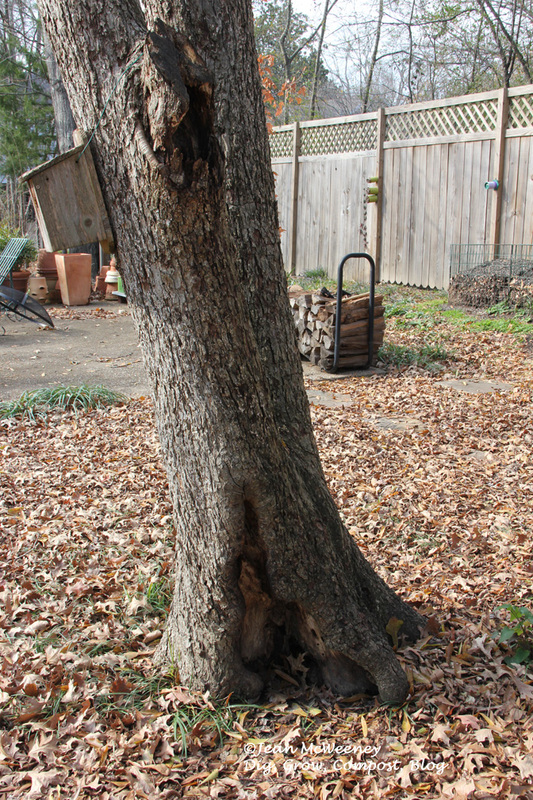 The old pecan tree has got to go. When we moved to this house 11 years ago, this old tree was being strangled by the invasive Chinese wisteria. It also had this hollow area you can see at its base. At that time we decided the hollow wasn't too bad yet, and we relieved it of the wisteria and trimmed up a bunch of branches so it had less weight on it. But sadly, the hollow has grown enough that it's best to remove it before it comes down and does some real damage. You can't tell from this photo but the tree has a fork down by that hollow. So one side or the other is going to go fairly soon. But I thank the tree for its service to the yellow-bellied sapsuckers, flickers, woodpeckers, and my shade garden. Now, if I could just get through this next month. Oh I forgot! I have a good weekend to look forward to - it'll be in the low 70's and all the plants I ordered should be delivered by then! 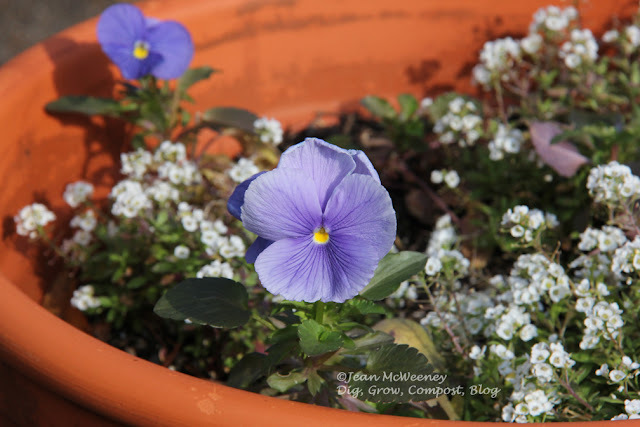 It'll be time to clean up for spring and plant some new things! I hope your spring comes soon, too. 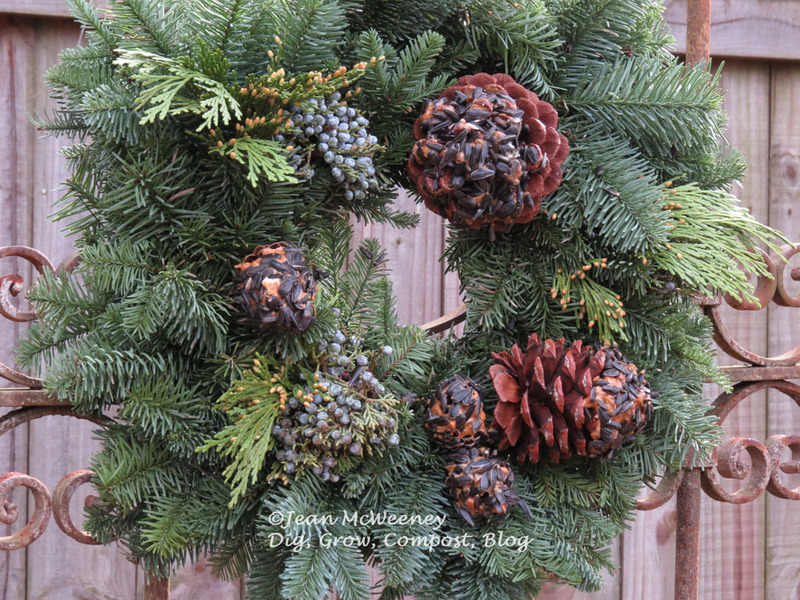 This post was written by Jean McWeeney for my blog Dig, Grow, Compost, Blog. Copyright 2016. Please contact me for permission to copy, reproduce, scrape, etc. Nice to see your winter blooms. I so admire 'Peggy Clark', such a lovely color. So sorry about the pecan tree will you take it completely down or leave a tall stump for the critters? I'll probably have it taken down completely since I want to plant some things near there and I think it would detract. Unless they can make it pretty short, which would be fine. I would love to have a bird feeder but fear winter travel with no one to fill up the feeder would be a problem. I have never heard of a white throated sparrow and all those goldfinches. Mine seem to disappear for the winter although I think people who have feeders have them. Will those blooms on the apricot survive a frost and the lemon? Mine are far off flowering. Maybe still recovering from the hail last year. What a crazy winter we are having. It makes me nervous. 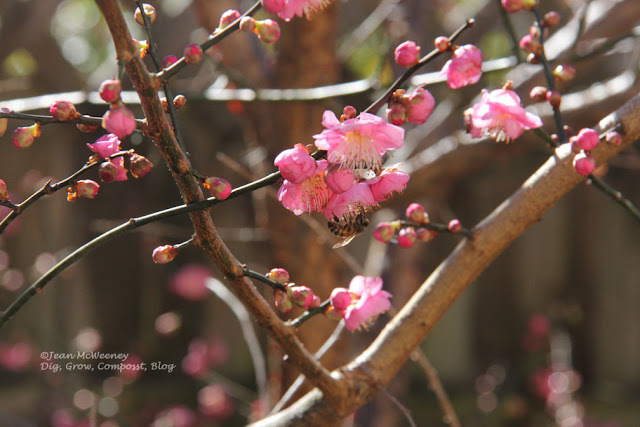 The apricot blooms have survived many a freeze in the past. 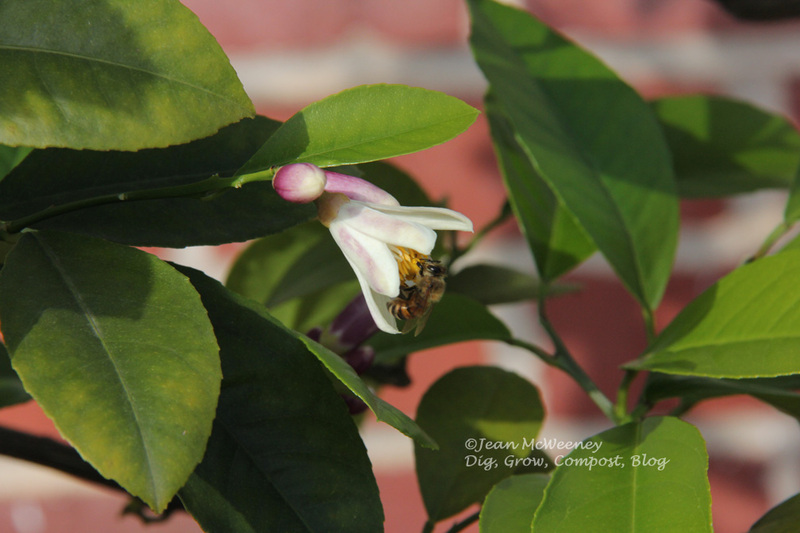 So far this year the blooms on the lemon have survived a couple freezes though I've covered the plant each time. But our freezes have not been as low or long as in previous years when I almost lost the whole plant. BTW Jenny, the white-throated sparrow and American goldfinches are found in Austin in the winter. The lesser goldfinch, which is similar to the American, is found in/near Austin year-round. We participate in Project Feeder Watch and the Great Backyard Bird Count. Love seeing how many birds we can attract to our garden. I've been adding a lot of berry producing plants to attract more of the berry-loving birds. Cedar Waxwings still elude me. I'm impressed your lemon tree stays outside during the winter. I bring mine in to be safe. We are officially 8a (when they changed the heat zone map a few years ago) but I don't think mother nature told the plants. They still think we are 7b. I'm so glad to hear you participate as well, Karin! Cedar Waxwings just showed up for me this week. Soon the berries on our Savannah hollies will be eaten I predict! The low 70s! You are killing me. Cold and wintry up here in Wisconsin. Your bird wreath is gorgeous: pretty and useful. We had to take down a 50 year old apple tree last year. When the big trees were planted on our property I am sure the original homeowners thought 50+ years was incredibly long life. But as the second owners we are seeing a lot of trees nearing the end of their natural lifespan. We've planted an understory but we are losing our canopy and you know how long it takes for those kind of trees to mature. We won't live to see it happen with the trees we will replace them with.